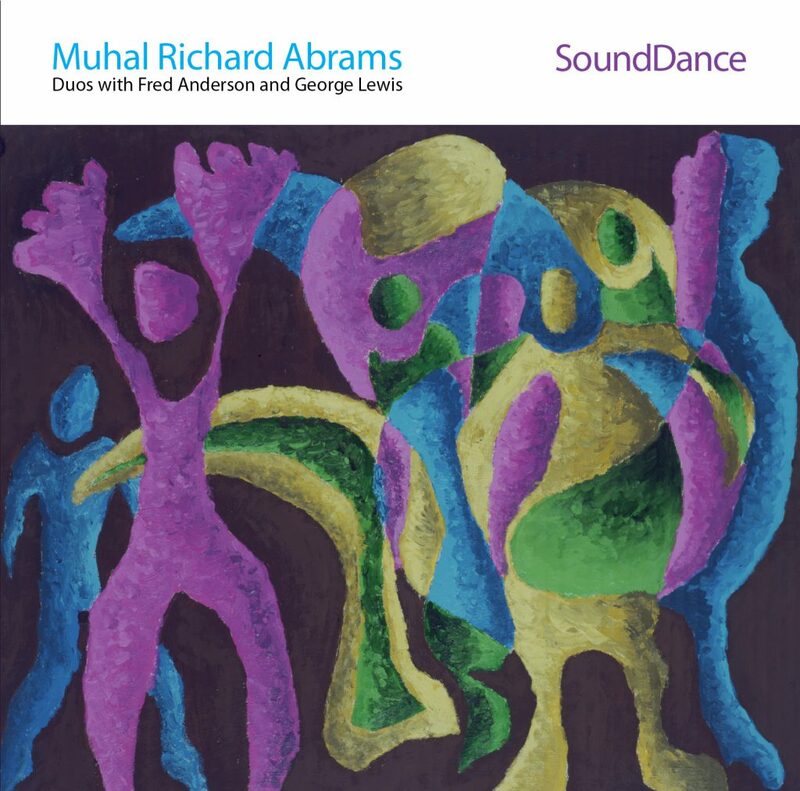 The release of SoundDance celebrates the 80th birthday of the hugely influential pianist and composer Muhal Richard Abrams, a double CD set that captures him live in concert in two fully-improvised duo performances. Disc one, Focus, ThruTime Time→, features Chicago tenor saxophone titan Fred Anderson in his first release with Abrams despite a history going back over fifty years. It is sadly also perhaps the final recording of Anderson, who passed away in 2010 at the age of 81. The second, SoundDance, features Abrams with the laptop and trombone of George Lewis, the composer and MacArthur Fellow who is well known for his innovative work in interactive computer music. The performances place Abrams in two very different situations: His duo with Anderson finds him in a more familiar acoustic setting, while the one with Lewis finds him negotiating through a vast array of acoustic and electronic sound textures. Both performances are unfettered by traditional song structure and represent the height of spontaneous artistic invention. Abrams is one of the most important jazz musicians of the last 50 years. A mainstay on the Chicago music scene starting the mid-1950s, he began leading the Experimental Band in the early 1960s as an outlet for his own expanding musical palate. Many of the musicians who played with Abrams, including Roscoe Mitchell, Joseph Jarman and Henry Threadgill, went on to help him found the Association for the Advancement of Creative Musicians (AACM), an influential force in forward-thinking jazz. Since then, Abrams has released over 25 recordings, led innumerable groups, and been commissioned to compose works for symphony orchestra and string quartet. In 2010, his 80th year, he was named a National Endowment for the Arts Jazz Master and to the DownBeat Hall of Fame. Fred Anderson was an early member of the AACM and a stalwart on the Chicago scene not only as a musician, but also for over a quarter-century as the proprietor of the Velvet Lounge, the epicenter of that city’s flourishing avant-garde jazz scene. He was also mentor to a number of the second generation AACM members such as George Lewis, Douglas Ewart, Steve and Iqua Colson as well as an entire generation of forward-looking young musicians in Chicago, including Ken Vandermark, Mike Reed, Nicole Mitchell, Matana Roberts, Corey Wilkes, Chad Taylor and countless others. Focus, ThruTimeTime→ is decidedly different. This performance is a true dialogue; a non-hierarchical interaction between two old friends. Each musician is on his toes at all times, spontaneously reacting to every twist and turn. Abrams plays with his usual probing inventiveness and was clearly not going to let Anderson settle into his comfort zone. In so doing, Abrams elicits from Anderson some the most surprising playing he has committed to record. Anderson passed away on June 24, 2010, the same night he was due to perform at the Vision Festival in New York during an evening feting the career of Muhal Richard Abrams. SoundDance, the duet with George Lewis, was recorded during an evening celebrating Abrams 80th birthday. Lewis, the composer, trombonist, technologist, historian, professor of composition at Columbia University, and author of A Power Stronger Than Itself: The AACM and American Experimental Music, presents an entirely different set of challenges for Abrams. Lewis uses the infinite array of sounds and textures at his disposal to paint a picture full of tonal and textural variety, provoking Abrams to respond in ever more surprising ways. Listening to this music is like going on a journey you trust that the two will take you somewhere fascinating that you’ve never been before. After a quiet opening filled with space, Abrams and Lewis mount wave after wave of tension and release. The world they evoke is one seemingly filled with angst and a sense of foreboding, hardly a mood one often encounters in jazz. Taken together, the two performances captured on SoundDance reveal in Abrams a man who, even at the age of eighty, remains dedicated to the pursuit of adventurous experimentation in the art of improvisation.